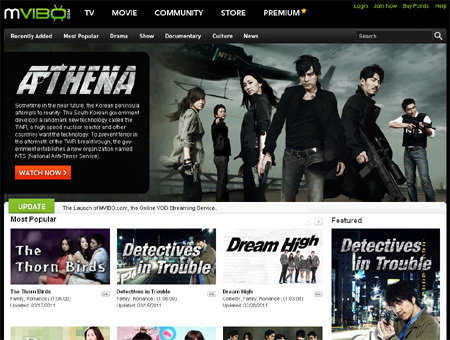 Well, don’t count on liberating yourself soon, because Multi-cultural Video Broadcasting’s web site MVIBO.com, is providing a video-on-demand (VOD) service offering licensed Korean dramas, movies, clips and music videos complete with subtitles. KBS America is at the forefront of this project. They are a Los Angeles-based company that provides KBS (Korean Broadcasting System) programs in North America and are dedicated to spreading the love between the U.S. and the good old R.O.K. Most media content on MVIBO.com is viewable with free registration. Points can also be purchased for access to full drama series or viewers can also obtain exclusive access to full series of drama episodes with the purchase of points ; if you’re really die-hard k-everything fan, you can get unlimited access for $11.99 per month. Man, they are really not joking with this hallyu thing.